SULLIVAN COUNTY TOWN OF ROCKLAND & FREMONT (November 11, 2014) –Senator John Bonacic (R/C/I – Mt. Hope) has secured $50,000 grants for both the Town of Rockland and the Town of Fremont. Both grants are from the State & Municipal Facilities Capital Program. 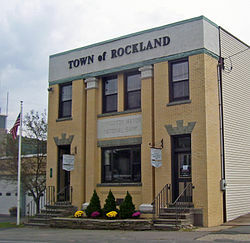 In the Town of Rockland, the funding will go towards the construction of a new highway garage that will provide adequate space for department equipment, including its two full-sized plow trucks. The facility will also provide staff offices, and serve as a temporary shelter for residents affected by storm-related events. I n the Town of Fremont, the funding will go towards replacing the Lake Muskoday Bridge on Lake Muskoday Road. “This bridge is vital for the residents who live in that community. It’s the only way for them to travel in and out of their development, and the only way for vehicles to gain access should an emergency arise. I am pleased to secure this funding so this bridge can be replaced,” said Senator Bonacic.